Unconditional love comes on four legs. Yeah, that’s what I thought he said. Comet was Josiah’s dog of sixteen years. And Since I’ve been with Josiah for almost seven, it’s safe to say she was like my dog as well. And it just hit me. I mean, she was sixteen so it’s not like she was a spring chicken. But still, I just saw her and she was fine. And now all of a sudden she’s gone. And then I started to cry. I cried and I went into my house and there was my dog, Bandit. Good old Bandit who is going to be thirteen in November. And it made me start to think. Here are these loving animals who are more family then some members of my own family and the thought of loosing them literally yanks at my heart. Because if I have a bad day, Bandit doesn’t ask me what’s wrong. He just lets me pet him. 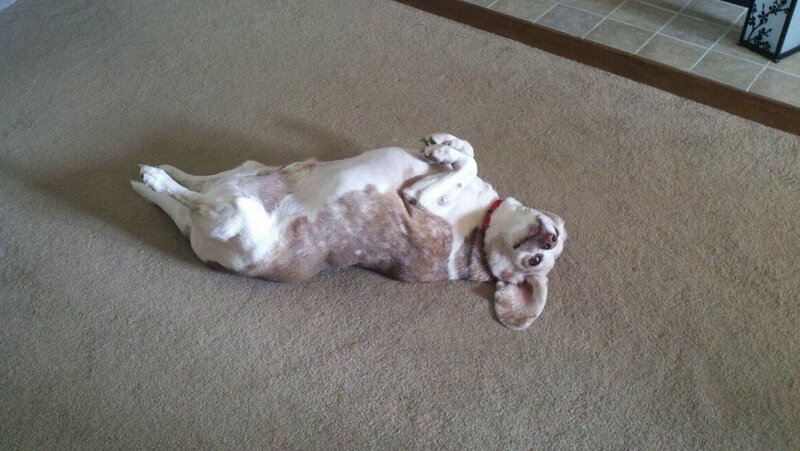 And when I wake up in the morning he has me laughing because I walk into the living room to find him lying on his back. And he get’s me so mad when he decides that my twin size bed is more comfortable to sleep in than his own, but I can’t stay mad for long because he’s the perfect blanket with his warm body heat. Proof that I’m not joking about Bandit on his back. Dogs get you through your day and sometimes we’re just so busy that we don’t realize it. They love you with all their hearts, because that’s all they know. And when they’re gone, it’s kind of like, “What now?” Do we go out and get a new dog to try to fill that void? Or do we spend the appropriate time grieving like we should because they deserve our grief. When someone that we love dies and we cry and express grief, we’re not crying for them. All of their pain and suffering is over. We’re crying for ourselves, for our loss. We’re going to miss them and we want them here with us. I spent my weekend with Josiah. We laughed a lot. We talked about all of the funny things that Comet did. We also talked about her final hours and how Josiah was there to take care of her. After she had her stroke, Josiah lied down next to her and petted her and tried to keep her calm. I’m sure that he told her how much he loved her and what she meant to him. He took her to the vet in her bed. He was with her to the end. I have a lot to thank Comet for. She was with him since he was six years old after all. A boy who grows up with a dog learns a lot. And I know that Comet helped to shape Josiah into the man he is today; the man that I love. She was the joker in our family. She had a personality that was more human then dog. She made us all laugh. She loved us all. Our little lady, Comet. RIP girlfriend. I know that as Josiah and I grow older and welcome new dogs into our family he’ll think of Comet. She was his baby, his first dog. They hold that special place in our heart and stay there with us. And I’m still crying. And I know that I’m not going to stop anytime soon. 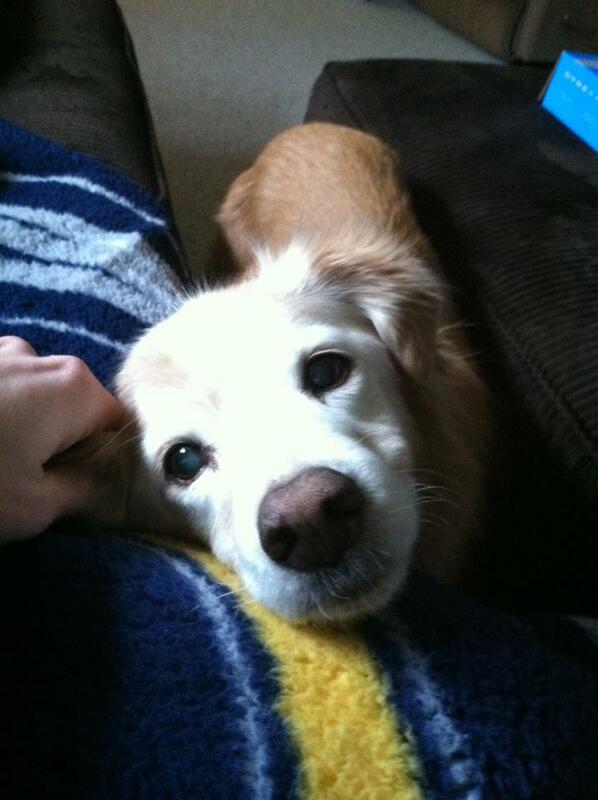 But it’s okay, because crying is just how I’m expressing my love for this furry female right now. And I’m hugging Bandit a little tighter as well. Because loosing Comet was also a reminder that my old man is just that, an old man. And I’m treasuring these days I have with him. And I’m thankful for his unconditional love and his annoying Beagle howl, no matter how loud and obnoxious it really is. Lauren, this really made me cry! I had a dog named Ally when I was younger. I miss her with all my heart. I’m sorry for your loss. When Ally died, dad gave me a candle, like we give to family’s. Maybe you could give one to Josiah? Read Caleb’s website and your guest post there and decided to come read your official blog. This post hits so close. My cat is 18 years old and she’s been with me for most of my life as well (I’m 26)… Mom took Liz to her place while I was on vacation and for a week after I came back, my apartment was empty. It felt so surreal not to have Liz there (and the habit of buying cat food before getting something for myself still remains). Thankfully, as I am writing this, I am at my mom’s house and Liz hasn’t left my side all evening – and tomorrow we’re going home. Yet, like you mentioned, our pets become more than simply animals that live with us. They become a part of the family – something only those who had long-living pets can understand.